Solar power isn’t just for homes and businesses. Churches, mosques, synagogues and other houses of worship can benefit substantially from photovoltaic systems. Many religious buildings use electricity every day, and the utility bills are paid out of the ministry’s coffers. With a photovoltaic installation, however, churches can create their own energy from the power of the sun, freeing up those funds for more appropriate uses. Why Should Churches Purchase Solar Power Systems? With no money down, leasing solar panels may seem like a good option for many religious organizations. However, many churches have owned their own property for decades (or even longer) and have no plans to move to a different building. So why not choose a permanent installation and allow the congregants to enjoy the benefits of solar energy for years to come? In addition, leasing brings uncertainty. If the church leaders don’t agree to the terms of a new lease, or are unable to afford to buy the system, the leasing company will typically remove the photovoltaic panels. In that case, the church will still be responsible for any necessary roof repairs — a potentially costly problem. 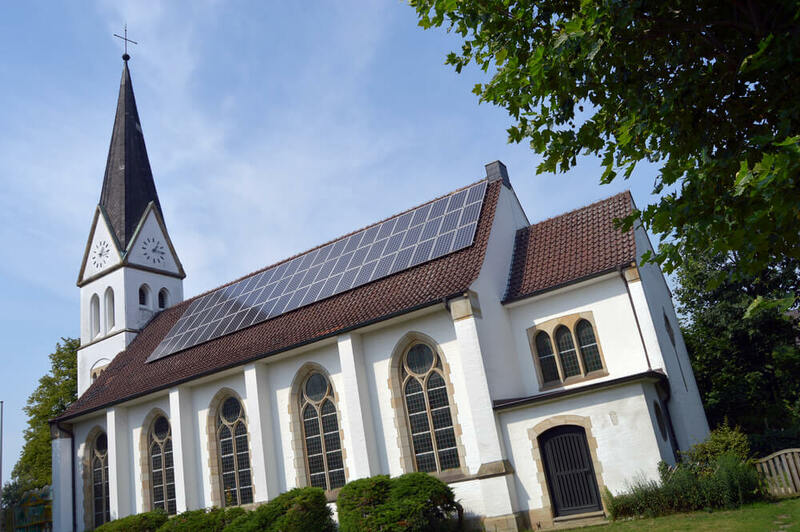 Can Churches Take Contributions for Solar Power Installation? The upfront cost of installing a photovoltaic system may be daunting for many churches. As nonprofit entities, churches cannot usually benefit from the federal incentives (tax breaks) that make solar power affordable for homeowners and businesses. Some religious organizations overcome this hurdle by raising money for their solar energy installation projects. Today, with crowdfunding and social media-based fundraising efforts, contributions from the congregation and community can add up quickly, putting photovoltaic investment costs within reach. Can Parishioners Form an LLC to Install Solar Power? Many U.S. churches have discovered another creative method for financing their photovoltaic projects: using members of the congregation as investors. Parishioners come together to create a special limited liability company (LLC) to fund the photovoltaic system installation. The LLC qualifies for state and federal solar tax credits, which helps to bring down the cost significantly. The LLC pays for and owns the photovoltaic system, and the church pays the LLC for the solar energy the array generates. In most cases, the LLC charges a flat rate for the electricity, allowing the investors to break even in the long run. You can read many success stories from around the country online, where congregations have used this method to install solar panels on their church. Are you considering solar energy for your ministry? 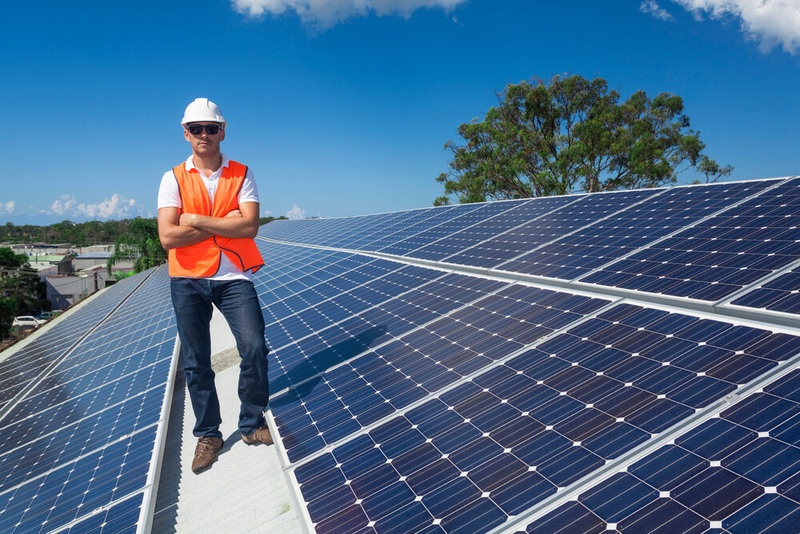 An experienced photovoltaic contractor can help you understand your purchase options and work with you to design an affordable and cost-effective system. Intermountain Wind & Solar offers complimentary consultations to houses of worship throughout Utah, Nevada, Idaho, Colorado and Wyoming. To explore the possibility of solar power for your church, synagogue or mosque, contact us today. Are Secured or Unsecured Solar Loans Better for You? Solar loans make investing in a home photovoltaic system easy and affordable for homeowners throughout the Intermountain West. Most solar lenders require little or no money down. And unlike leasing, solar panel financing allows you to retain ownership of your photovoltaic energy system. That means you can take advantage of the 30 percent federal tax credit, as well as other lucrative state and local financial incentives. Many banks, credit unions and private lenders offer secured and unsecured solar loans. What’s the difference between these financing options? And which type of loan is right for you? What Are Secured Solar Loans? Secured solar loans require you to provide some sort of collateral, typically your house. Home equity loans and lines of credit, FHA loans and PACE loans are all similarly secured by collateral. With this type of loan, the lender places a lien on your property, and if you fail to repay the loan according to the terms, they can take possession. Since secured solar energy loans put less risk on the lender, they typically have lower credit score requirements and lower interest rates than their unsecured counterparts. And in most cases, the interest you pay is tax-deductible. However, to qualify for a secured loan, you will need a favorable debt-to-income ratio, as well as sufficient equity in your home. What Are Unsecured Solar Loans? Unsecured solar energy loans do not require collateral. Financing a photovoltaic system installation with an unsecured loan means you don’t have to put your house or other property on the line. However, as these loans pose an increased risk for lenders, they usually come with higher interest rates. And the interest paid on these loans is probably not tax-deductible. The biggest benefit of this option is that most homeowners can quickly qualify for unsecured solar energy loan programs. Many professional solar contractors, including Intermountain Wind & Solar, offer financing for photovoltaic installations. Because secured loans have lower interest rates, they offer a better long-term value for homeowners. A secured loan may be a good option if you have enough home equity to cover the cost of a photovoltaic installation. If you don’t have enough equity, an unsecured loan is the way to go, especially if the interest tax deduction is not a pressing concern for you. An unsecured loan is also more attractive if time is a factor. Secured solar loans can take weeks to finalize, delaying your photovoltaic system installation. With many unsecured loan providers, you can be approved within minutes. Would you like to learn more about your photovoltaic financing options? The professional solar contractors at Intermountain Wind & Solar assist homeowners throughout Utah, Idaho, Nevada, Colorado and Wyoming in finding the best way to invest in photovoltaic power. Contact us today to learn more about solar loans and other finance options. Will Solar Panel Prices Continue to Fall? Solar panel prices have fallen dramatically over the last few decades, so investing in photovoltaic power has never been more affordable. Yet many homeowners and business owners continue to put off installing a photovoltaic system because they expect further cost reductions. If you’ve made the decision to adopt solar energy, does it make financial sense to hold out a little longer, in hope of further price cuts? Every new technology is expensive when it first hits the market. Over time, manufacturing processes are streamlined and raw materials become cheaper. And as supply increases, costs go down. This is the law of supply and demand. Photovoltaic panel prices have followed this pattern across the decades. In the 1970s, the high cost of PV panels put them out of reach for most consumers. Fast-forward to the 1990s, and costs have dropped by nearly 85 percent. Today’s solar adopters pay about 60 percent less than those who installed photovoltaic systems in 2008. These price drops occurred primarily due to new skyrocketing demand combined with technological developments in photovoltaic manufacturing and materials. This phenomenon, documented by The Economist in 2012, is known as Swanson’s Law. Solar industry experts do not expect massive cost reductions in photovoltaic panels over the next few years. While materials costs may come down slightly, huge price drops are a thing of the past. In fact, global solar panel costs have leveled out already. Why is this? Aren’t new technologies for manufacturing photovoltaic panels still under development? Yes, photovoltaic manufacturers will continue to chip away at the costs, but there’s only so much they can do to lower prices any further. In fact, there’s potential for a slight increase in solar module import tariffs. And if more solar companies consolidate, demand for panels could outstrip supply. Consequently, PV module prices could possibly even go up a bit, at least temporarily. Install photovoltaic panels now, and you’ll be eligible for some incredibly lucrative financial incentives. The federal solar investment tax credit (ITC) gives you back 30 percent of the cost of your photovoltaic system, in the form of an income tax liability reduction. Add in state and local rebates, grants, tax credits and solar renewable energy certificates (SRECs), and you could save thousands more. However, state and local financial incentives are rapidly disappearing across the country. And the federal solar tax credit could be in jeopardy as well, under new administration policy changes. Homeowners have until the end of 2019 to claim the full 30 percent. The amount steps down gradually after that, and is scheduled for elimination in 2022. Although no plans have been announced for repealing the solar ITC, history tells us that it could happen. In 1986, President Ronald Reagan abolished the first federal tax incentive for photovoltaic installations. If you hold off on investing in solar panels, you could miss out on these savings. The sooner you schedule your installation, the better chance you have of taking advantage of these cost-cutting opportunities. Intermountain Wind & Solar offers a wide range of affordable photovoltaic system installation options for homeowners and business owners throughout Utah, Nevada, Colorado, Wyoming and Idaho. Contact us today to schedule a professional site evaluation, or to request solar panel price details. A professional solar site evaluation is invaluable for helping you understand the benefits and challenges of installing a photovoltaic system. And getting an expert opinion won’t cost you a thing. Most photovoltaic contractors — including Intermountain Wind & Solar — offer free consultations to homeowners and business owners who are considering making the switch to photovoltaic energy. A site assessment provides a clear picture of how well a PV panel array will work for you. One of our experienced photovoltaic experts will visit your home or business to assess its potential for harnessing energy from the sun. Checking out your roof is the first step of the solar site evaluation. Photovoltaic systems can be heavy, and depending on how many panels you need, your roof must have adequate support. And although solar contractors aren’t roofers, we point out any obvious, visible damage that should be fixed prior to your photovoltaic installation. In examining your roof, we also check skylights, vents and other obstructions that could hinder the placement of a solar array. We also consider the orientation and pitch of the roof to ensure that photovoltaic panels can face and tilt toward the sun. If your roof isn’t ideal for a photovoltaic array, our solar expert will look for a sunny spot on your property to install a ground-mounted photovoltaic array. For both rooftop and ground-mounted photovoltaic arrays, shading can be a problem. Any shade that falls on your solar panels can cause a reduction in the power output. So the next step of your site evaluation is a thorough shade analysis. We use several on-site tools and software programs to determine the amount of shading that affects your rooftop (or ground-mount location). We also take seasonal variances into account. Some shade obstructions, like chimneys and nearby buildings, cannot be helped. But whenever possible, trimming trees and removing obstacles helps increase your energy output. Once we complete the roof examination and shade analysis, it’s time for the final step of the site evaluation — a complete explanation of the results. We explain the solar potential of your property and recommend the photovoltaic components that we believe are best suited to your goals. We can also explain your options for financing at that time. We also address any questions or concerns you may have to help you make an informed decision about adopting solar energy. Intermountain Wind & Solar, the region’s leading photovoltaic provider, provides professional consultations for homeowners and business owners throughout the Intermountain West. Contact us today to request a quote or to schedule your professional solar site evaluation. If you want to determine the solar potential of your property, Google’s online tool, Project Sunroof, can help. When Google created Project Sunroof in 2015, its coverage area was limited. Since then, however, Google has greatly expanded, and now states in the Intermountain West are included in the database. Google’s online tool makes finding the solar potential of your home quick and easy. Plug in your address, and through the power of Google Maps, the tool calculates the amount of sunlight that hits your roof over the course of a year. The site uses high-resolution aerial imagery, so you can see a 3D model of your roof and envision the placement of a solar panel system. Because Google uses an advanced computer algorithm that reduces errors, this tool is considered to be more accurate than many other solar calculators. To determine your solar potential, the program factors in the sun’s position throughout the year and shading from nearby trees and buildings. Then, Google’s online tool recommends a solar panel system size that is capable of powering your home. This figure is based on the average monthly electric bill in your area, but you can tweak the amount if your utility bills are higher or lower. After offering a cost estimate, the program determines how much you could save by installing a solar energy system. General information about financing is also provided, so you can get a look at your potential annual savings. Google’s tool is helpful for exploring solar potential, but it has its limits. As the program is automated, it cannot address any unique features of your property. In addition, Project Sunroof is purely informational. The site is unable to answer questions regarding the results of the property evaluation. An experienced professional photovoltaic contractor can provide you with more comprehensive information than the Google tool. Not every rooftop is a good fit for a photovoltaic installation. Some are structurally unsound while others have shading issues. But many properties can accommodate a ground-mounted solar array — an option not considered by Project Sunroof. The professional team at Intermountain Wind & Solar, the region’s leading photovoltaic provider, serves residential and commercial customers in Idaho, Colorado, Utah, Nevada and Wyoming. Contact us today to discuss your home’s solar potential and request system pricing information. Solar batteries aren’t a requirement for a grid-tied PV system, as the utility company provides electricity when the sun isn’t shining. Even so, installing a battery bank can be a wise investment for homeowners stuck with unfavorable electric utility rate policies. If yours includes any of these impractical pricing structures, you can increase your cost savings by adding solar batteries to turn your grid-tied photovoltaic array into a hybrid solar power system. Many utility companies have adopted time-of-use (TOU) rates. Under this rate structure, the amount you pay for electricity changes depending upon the time of day. When demand on the grid is high — typically in the late afternoon and evening — the utility company charges you more per watt used. Electricity costs less at night and earlier in the day, outside of these peak hours. Solar batteries can help grid-tied PV system owners avoid paying these high rates, as stored electricity can be used during times of peak demand. Some utility companies have demand charges for residential solar customers. This fee is based on the highest average amount of electricity used during any 15-minute period of the current month. Demand charges are intended to ensure that the electric grid has sufficient generation and transmission capacity to meet demand during the peak hours. Grid-tied PV system owners who see these fees on their utility bills may want to consider solar batteries. A battery bank with demand response will kick in and supply electricity when increasing energy usage is detected. With no spikes in utility grid usage, demand charges usually go down. Net metering policies vary widely across the country. In some states, homeowners get paid the full retail rate for solar electricity sent to the utility grid. In many other states, homeowners get a reduced wholesale rate — or nothing at all. In areas where grid-tied PV system owners are not paid the retail rate for excess solar electricity, adding a battery bank can make good financial sense. Solar batteries will store your extra electricity for later use, maximizing the value of the energy your solar array creates. Power outages are on the rise across the country. And during blackouts, homes with grid-tied solar power are left without electricity — even if the sun is shining. PV systems that are connected to the utility grid automatically shut off in an outage. If they didn’t, solar electricity running through the power lines could seriously injure or kill workers making repairs. If you want a reliable source of backup power, solar batteries may be the perfect answer. With battery storage, you’ll still have electricity when the grid goes down. Would you like to learn more about your battery storage options? Intermountain Wind & Solar, the region’s leading photovoltaic provider, offers complimentary consultations to homeowners in Idaho, Nevada, Utah, Colorado and Wyoming. Contact us today to discuss adding solar batteries to your grid-tied solar PV system. Will My Solar Panels Ever Need to Be Replaced? Solar panels are designed to be extremely rugged, and they can easily tolerate whatever Mother Nature decides to throw at them. However, photovoltaic modules aren’t immune to environmental exposure. Over the course of decades, they lose some efficiency. How long can you expect solar panels to continue to function effectively? And will you ever need to replace them? Nearly all well-established photovoltaic manufacturers provide 25-year warranties for their PV panels. The warranty guarantees that your photovoltaic modules will maintain an energy output rating of at least 80 percent for 25 years. If you have a string inverter, you can monitor your electricity production online or right on the LCD screen. For PV systems with micro-inverters, the energy output can be viewed on any internet-capable device. If you ever find that one of your solar panels isn’t as efficient as it should be, the photovoltaic manufacturer will replace the underperforming panel during the warranty period. In 2012, a National Renewable Energy Laboratory (NREL) research team analyzed solar panel efficiency and energy output over the life span of nearly 2,000 photovoltaic installations. The study found that traditional silicon-based solar modules see an average reduction of efficiency of just 0.7 percent per year. That means after 25 years have passed, most photovoltaic panels will still operate at about 82.5 percent efficiency. However, you might not even see that much degradation. A recent test of PV modules installed back in 1992 revealed only an 8.3 percent energy loss. After 20 years, the panels were functioning at 91.7 percent of their original maximum output. Although energy scientists haven’t been able to conduct many long-term solar panel studies yet, the data we have is very encouraging. For example, some panels have continued to outperform their factory ratings beyond age 30. And the world’s first modern solar panel continues to work after 60 years! Remember too that these are average estimates of solar panel life span. Solar customers in the Intermountain West experience less climate-related degradation compared to those in regions where humidity and salty air promote corrosion. Solar panels, just like other household electronics or appliances, will function more effectively for longer if you take proper care of them. Fortunately, maintaining your photovoltaic modules is easy. You’ll need to check them for debris buildup once in a while, and you may need to trim back trees and vegetation if any plants are shading the modules. An occasional inspection of your PV system is also a wise idea. If you notice any damage or deterioration of the panels or wiring components, have them repaired promptly. Failing to handle repairs can result in quicker degradation and reduced solar energy output. The professional team at Intermountain Wind & Solar is committed to providing superior-quality photovoltaic power systems for customers in Utah, Idaho, Colorado, Wyoming and Nevada. To learn more about how solar panel systems can benefit you, contact us today to schedule a consultation. Why Do Photovoltaic Panels Have Grid Lines? From a distance, photovoltaic panels appear to be solid black or blue. Get up closer, though, and you can see that solar modules have a pattern of white lines. What are these lines? What do they do? Do all solar panels have a visible grid pattern? The answer lies in the way PV panels are designed and constructed. The white lines on photovoltaic modules serve one of three important purposes, depending on whether they’re the gaps, the fingers or the busbars. The gap lines are spaces between the solar cells, through which you can see the panel’s white backing. The gaps are necessary to allow for thermal expansion of the cells when the panels heat in the sun. Both the fingers and the busbars are electrical conductors. The fingers, or finger-like contacts, are thin, metallic lines that collect and deliver energy from the solar cell to the busbars. Busbars, typically made of aluminum or silver-plated copper, run perpendicular to the fingers. They separate solar cells within the photovoltaic module and conduct DC current from the cells to the system’s inverter(s). Without these elements, harvesting electricity from solar panels isn’t possible. If you don’t care for the white grid pattern, you can choose solar panels that do not have visible gap lines running through them. These photovoltaic modules still have the necessary gaps, but the black backing hides them. Eliminating the gap lines makes the photovoltaic modules more aesthetically appealing — from ground level, they look completely black. Many homeowners appreciate how the look of these solar panels integrates easily with their roofs. But you can expect to pay a premium for modules with a black backing. In addition, black panels may be slightly less efficient than their white-line counterparts. Because of their darker backing sheets, these modules absorb more heat from the sun. The added heat can, in turn, reduce energy output. When shopping for photovoltaic modules, make sure you purchase from a well-known manufacturer. Name-brand solar panels are known to be reliable and durable. You can trust that they will remain operational for at least your 25-year warranty period, and probably many years longer. Selecting the right photovoltaic panels to power your home is a matter of comparing a variety of different factors. You need to consider size and watt capacity, solar cell type, module efficiency, power tolerance, temperature coefficient ratings, and of course, cost. Weighing these factors can be confusing and time-consuming, however. Fortunately, an experienced solar installer can help you determine which photovoltaic modules are most appropriate for your needs. Intermountain Wind & Solar is the region’s leading photovoltaic contractor. Our expert team can answer all your questions and explain how the components necessary for your photovoltaic power system work. We offer complimentary solar energy consultations for business owners and homeowners throughout Utah, Idaho, Nevada, Wyoming and Colorado. Trust IWS to help you select the right photovoltaic panels to power your home. When you contact a solar installer, you may not know enough about photovoltaic system installation to ask the right questions. At Intermountain Wind & Solar, we want our customers to make well-informed choices. To that end, we want to share four critical questions to ask your PV solar installation contractor before making the important decision to go solar. 1. Is My Roof Suitable for Solar Installation? The first fact you must establish is whether your property is a good fit for a photovoltaic panel array. If your rooftop is not suitable for a panel array, what are your options? Our professional solar installers are committed to helping our customers achieve their goal of adopting renewable energy. If your rooftop isn’t suitable, we’ll let you know and then we will work with you to find an alternative solution, such as a ground-mounted photovoltaic array. 2. How Long Is the Solar Payback Period? The solar payback period — the time it takes for your PV system to pay for itself through the generation of free electricity — is different for every customer. Consequently, it’s impossible to determine what your payback period will be without doing the math. State financial incentives and net metering policies vary. Other variables include the amount of energy you use each year, the size of your photovoltaic panel array and the number of sunlight hours your location receives. As you can see, photovoltaic systems have lots of variables, and so do the payback periods. Our solar installers can help you determine your expected cost savings and assist you in calculating your solar payback period. 3. Do I Need Roof Repairs Before Installing a Solar Array? Photovoltaic panels are heavy, about 40 pounds each. Add in the mounting racks, and the system can potentially put significant weight on your rooftop, depending on the size of your array. Older roofs may have deterioration or damage, or they may not be structurally capable of supporting a photovoltaic array. Although our solar installers aren’t roofers themselves, we always recommend that you complete any necessary repairs before installing a PV system. Otherwise, you could end up paying to remove and reinstall your photovoltaic panels when you have to repair the roof. 4. What Potential Challenges Should I Be Aware Of? You own your house, but in the Intermountain West, many squirrels, rodents and birds also call our region their home. When you install a rooftop photovoltaic array, you may provide these animals an attractive spot for nesting or seeking shelter. Birds may build nests under your PV panels and squirrels may try to chew the electrical wiring. If the critters do any real harm, it can lead to expensive repairs, as the damage may not be covered under standard PV equipment warranties. To help minimize this risk, our installers ensure that the installation is done using best practices that are building code-compliant and — to the extent possible — unfriendly to pests. If necessary, a perimeter screen can be installed to block the pathways under the PV modules. The professional team at Intermountain Wind & Solar will give you all the answers you need about installing a solar array. Serving commercial and residential solar customers throughout Colorado, Nevada, Utah, Idaho and Wyoming, we are the region’s premier solar installer. Contact us today to learn more about the benefits of photovoltaic solar energy. Does Corrosion Affect PV Solar Performance? A home PV solar power system harnesses the sun’s energy to provide you with free solar electricity for decades. But photovoltaic arrays are continually exposed to the elements. Consequently, they may degrade and lose a bit of efficiency over time. Corrosion is often to blame for degradation, as rust can affect the critical electronic connections within the panels, reducing the amount of energy they can produce. But just how much does corrosion affect your photovoltaic system’s performance? Anything that contains metal is susceptible to corrosion — including metal photovoltaic components. Photovoltaic modules are designed to last for decades as the solar cells and their electrical components are protected by sealants, encapsulating polymers and strong, tempered glass. But as time goes on, water vapor and airborne chemicals can get inside and cause rust degradation. Fortunately, metals corrode faster in hot, humid environments, such as those found in tropical and coastal regions. In the less humid climate of the Intermountain West, photovoltaic system corrosion is much slower to occur. Sandia National Laboratories is leading a Department of Energy SunShot Initiative project aimed at studying how corrosion affects PV system performance. As part of the Durable Module Materials (DuraMat) Consortium, Sandia researchers are seeking ways to increase PV component reliability and hasten the development of new, less-degradable photovoltaic materials. By accelerating corrosion under controlled conditions, researchers hope to determine whether corroded connections in PV panels can be minimized or eliminated. Scientists expect to learn more about how to create longer-lasting components through the use of these specialized corrosion chambers. Other SunShot Consortium corrosion research is focused on analyzing PV panel installations to determine how much energy output has been lost as a result of corroded components. Sandia scientists are also looking to design nano-composite films that can be used to protect against photovoltaic system rust. The SunShot Consortium research could lead to the development of new photovoltaic materials that are more resistant to corrosion. However, any marketable results are many years away. Scientific research and product development take time — it could be a decade or more before less corrosive solar components are ready for manufacturing. In fact, the research may not ultimately provide any actionable results. Waiting for unknown next-generation PV solar technology won’t provide any benefit if your goal is to save money now. Solar costs are at an all-time low, and financial incentives for installing a photovoltaic array are rapidly disappearing. When you choose a solar installer that uses high-quality PV solar panels and mounting components, degradation over time is minimal. Adopting solar now makes sound financial sense. The professional team of Intermountain Wind & Solar, the leading photovoltaic contractor serving Utah, Colorado, Wyoming, Nevada and Idaho, can design a cost-effective and efficient solar array to power your home. Contact us today to start planning your PV solar energy system.